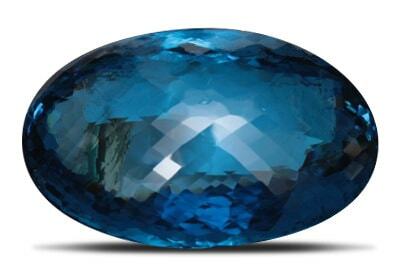 The worldwide fascination with birthstones has been on for at least a few millennia. The Indians, Greeks, Romans, Egyptians, and Persians are among the ancient civilisations that treasured these gems, these lucky birthstones according to date of birth, even thousands of years ago. The tradition, of course, has continued, for a variety of reasons. Precious gems make for wonderful trinkets and birthstone jewellery is as symbolic as it is beautiful. You may believe they bring you luck, or just love the way they look. It’s not uncommon to gift a birthstone necklace, a birthstone bracelet or other birthstone jewellery to someone special on milestone birthdays. In fact, birthstone rings are a popular choice for those who wish to wear finger rings adorned with a stone. And it’s not just for women, men’s birthstone rings are already popular in Asia and gaining ground internationally. Birthstone engagement rings and birthstone wedding rings, too, are the go-tos when looking for unique and off-beat options. If you are questioning yourself “What is My Birthstone?”, the first rule is to find out your gemstone according to your date of birth. That is, which birthstone falls under your zodiac sign. Then you can choose that perfect pair of birthstone earrings or birthstone charms to buy. Here is the list of associated birthstones by Zodiac sign. Aren’t you lucky if you’re born under the Aries sun sign? Derived from the Greek word Adamas, the diamond is a gemstone for Aries represents strength, long-lasting love, and affection. Ambitious and fearless, Aries strives to be the best in everything they undertake. 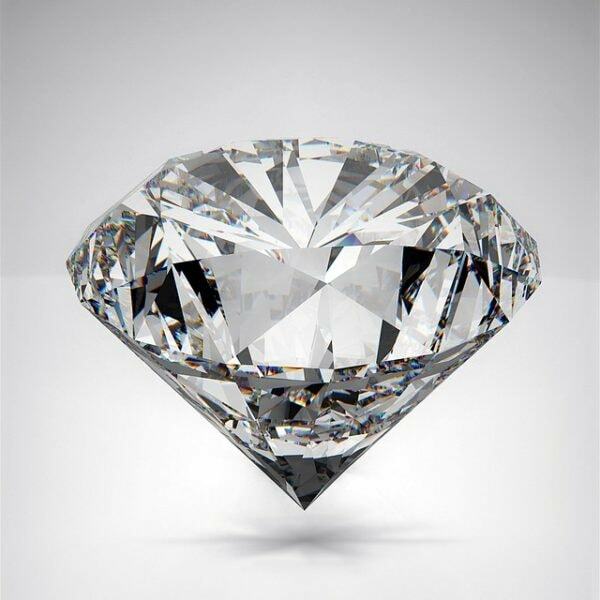 It’s no wonder then, that the stone that represents them is the mighty diamond – the hardest substance on earth. Passion and strength embody the people born under this sign, making them great leaders. The diamond shows the wearer’s willingness to move forward in difficult situations, much like the hardheaded Ram, the fearless animal that represents the Aries zodiac sign. Need another reason to buy a diamond birthstone necklace? It is believed that when Aries wears birthstone jewellery, the diamond can help provide a clearer path as you forge your way ahead. Looking to buy a diamond? Don’t be misled by ambiguous claims. Read these diamond buying tips to get your money’s worth. Taureans are among the most sensual of the zodiac signs – ruled by the planet Venus, they love luxury and the finer things. Those born under this sign enjoy the feeling of being pampered and feeling serene – something that is reflected in the soothing properties of their birthstone as well. They aren’t slackers, though. They are driven and will work tirelessly to achieve their goals of a comfortable and enjoyable life. The gemstone for Taurus, the emerald, is said to bring insight, good fortune and vitality to the wearer. In ancient times, the green of this birthstone was said to be the dewdrops of Venus. An emerald on a Taurean (i.e. bulls) adds a touch of tranquillity and calm to soothe the passionate nature of the Taurean. It is said that when a Taurean wears an emerald, they move closer toward an awakening of a spiritual kind, where they become more aware of their surroundings and less focussed on their personal wants and desires. For those Taureans who have an affinity toward material things, wearing an emerald can aid letting go of these attachments, leading to the appreciation of more meaningful experiences. Versatile Gemini has a lot going on – whether hobbies, jobs or friends, Geminis have their plates full but they love it. This playful and smart Gemini zodiac sign is represented by the equally iridescent gemstone pearl, both their luminescent beauty drawing in admirers. This moon-shaped pearl is among the most well-loved gems, produced in the ocean (and not a gemstone at all). For aeons, it has been a symbol of innocence. 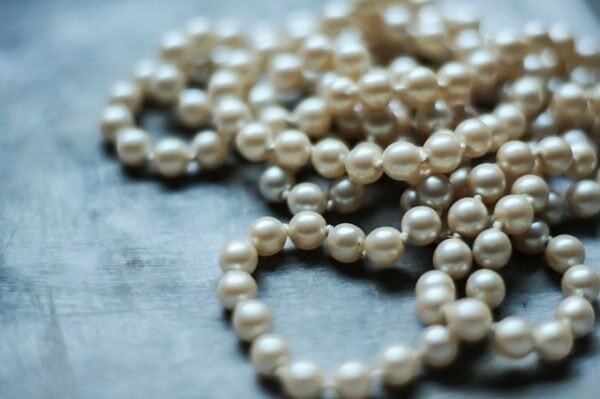 While in Greek mythology, the pearl represents the tears of God, Arabs believe that pearls were created when moonlight fell on dewdrops on the ocean floor. Pearls are delicate and highly vulnerable to light, usually worn as necklaces and bracelets. A single pearl also makes a wonderful birthstone pendant for Gemini. 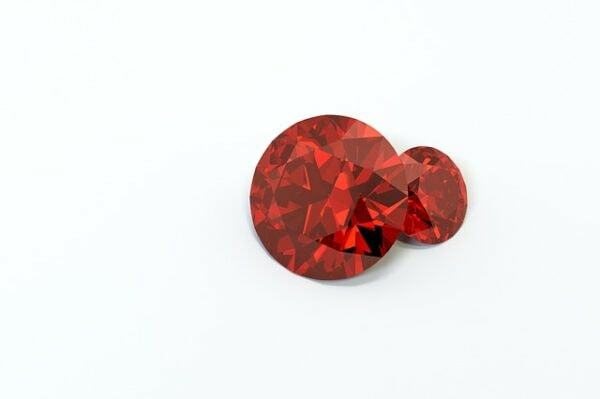 Ruby birthstone jewels are striking and stunning. The king of gems, Ruby is the Cancer gemstone have always been linked to royalty. 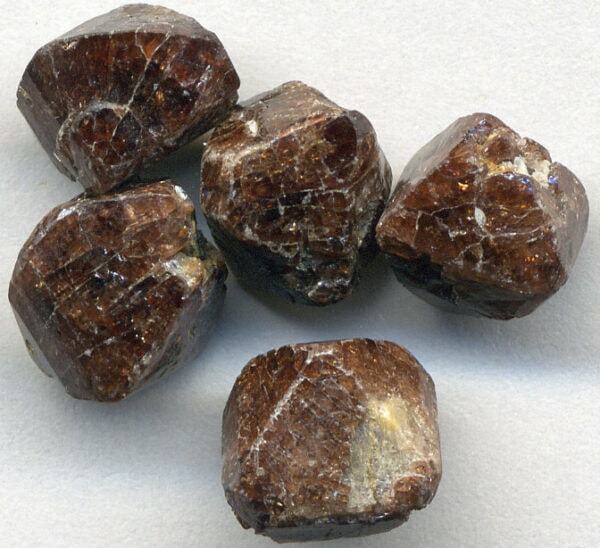 Today, this fiery stone is typically associated with love and passion, but it has other properties, especially useful to Cancerians, that should not be dismissed. Cancerians have the ability to easily read energies, whether it’s a room or people or just one person. While they are extremely intuitive, they are also reserved and their hard shell often hides their true, gifted personalities from the outside world. Wearing a ruby can aid the confidence of a shy Cancerian, helping them excel in their career, professional and personal life. When the crab wears a ruby, they are completely protected, allowing them to dismiss any pressure to not be themselves. 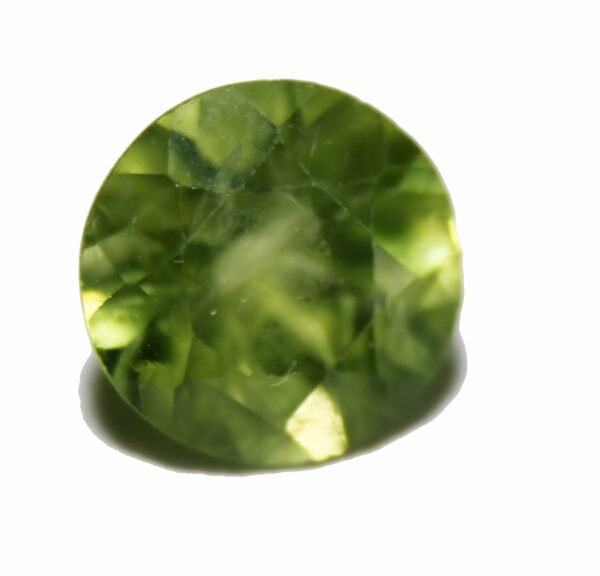 If you are looking for unique gemstone jewellery for a Leo, Peridot makes for amazing adornments. Since the ancient times, Sardonyx was the birthstone of those born in August. However, as time went by, the Sardonyx was replaced by the gemstone Peridot. This stone is believed to give the wearer of the jewel power and influence, appropriate for the vivacious and passionate Leo, represented by the king of the jungle – the lion. Leos love the spotlight and the Peridot is a perfectly-unique gemstone to celebrate their individuality. Spinel is another stone associated with Leos. Many believe that the Spinel stone protects daring and dramatic Leos from harm. Sapphire is the gemstone of Virgo and is one of the most desired gemstones in the world. Available in a variety of colours, this stone’s colour is usually specified with its name (eg. pink sapphire), except when referring to the stunning blue variety, which is simply called Sapphire. Those born under the Virgo zodiac sign are known to be meticulous and practical. Virgos are renowned perfectionists who analyse and plan everything down to the last detail. Wearing a sapphire, therefore, is highly beneficial as sapphires are believed to make their wearers even more observant. It is also believed to protect the wearer from envy and represents trust. In ancient times, clergymen often wore jewellery with Sapphire stones as a symbol of their holiness. Opals are gorgeous stones that come in a range of colours and can even change colour as light reflects onto their surface. 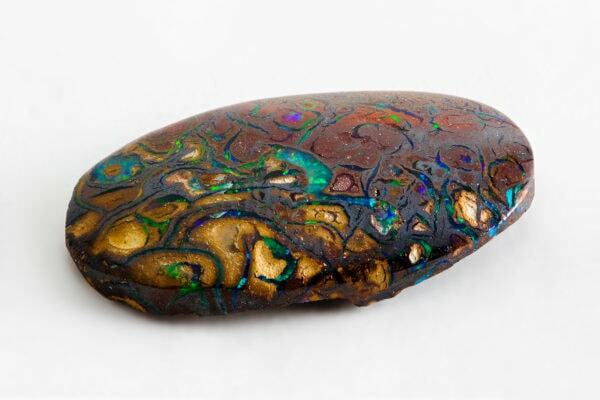 The Opal has the ability to absorb any bad aura in its vicinity. Librans are artistic and tasteful; their eye for symmetry make them lovers of exquisite design and hence Opal is a gemstone for Libra zodiac sign. They are also generous and friendly, keen not to upset the balance and harmony of situations – represented in the scales that symbolise this sign. But not everyone is as good-natured as the amiable Libran, who prefers to see the good in people. The Opal can help protect their wearer from the negativity and bad vibes of the people around them. Scorpios are intuitive and good readers of people. You don’t want to get on the wrong side of a scorpion; they’re calculating nature will ensure that they will get back at you in the future. It’s not to say they are vengeful but rather passionate and confident in their intentions – they expect the same sureness of others. This is why the ideal gemstone for Scorpions is the Topaz, a gemstone associated with love and affection. Bestowing strength and intelligence on all those who wear it, a Topaz gives Scorpions the depth to see things from other people’s point of view. Thus, it makes them more well-rounded individuals. Highly creative and always curious, Sagittarius loves the adventure of any kind and will always put themselves out there if it means experiencing something new and exciting. They are warm, welcoming and friendly – always surrounded by adoring friends and lovers. Their gemstone, Zircon, is for Saggitarius is thought to bring peace and prosperity to all Sagittarians. Available in a wide range of colours, zircons with earthly tones are popular as parts of jewellery ensembles. The first month of the year is when all of us begin on a fresh page. We make new resolutions, pledges to transform our lives and set new goals. The garnet is, therefore, an apt gemstone for Capricorns. With the body of a goat and a tail that is of a fish, the sea-goat is wilful and focussed but can also manoeuvre through obstacles with ease so that they reach their goals. This is why the garnet is so useful to Capricorns. The stone builds willpower, increases energy levels, and even boosts self-esteem – helping those born under this sign reach their potential even faster. 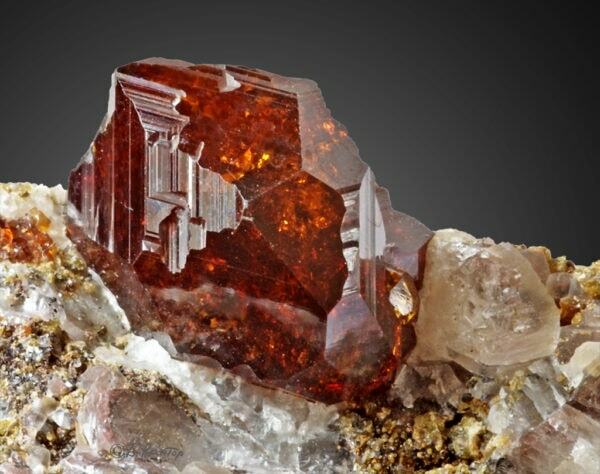 The Garnet is also believed to reduce body toxins, and ease depression. According to ancient legend, the beautiful colour of the Aquarians birthstone, Amethyst is said to have come from the tears of the god of wine, Dionysus. The Amethyst has a relaxing lavender hue that signifies serenity and temperance, perfect for those born in the cold, short and often frantic month of February. Free-spirited Aquarians are creative thinkers and philosophers who want to change the world. Brimming with ideas and passion, they can sometimes get carried away with their non-conforming attitudes. This is why amethyst is the perfect stone to lend a touch of practicality to their revolutionary thinking. Lore has it that this gemstone with keeping you levelheaded when worn and used to be carried and worn in jewels in ancient times as it was believed to prevent intoxication. Read more about the Significance and Meaning Behind Gemstones. Derived from the words ‘aqua’, which means water, and ‘marine’ which means of the sea, this stone embodies the depth, beauty and vitality of the ocean, wholly apt of the water sign Pisces. Pisces are sensitive, intuitive and compassionate but can often get lost between the realms of reality and their own comforting fantasy world. Wearing aquamarine helps bridge the gap and strike a balance between their real lives and affinity for daydreaming, as it is said to make its wearer wiser. Signifying calmness the aquamarine gemstone matches any summer and spring wardrobe perfectly. This gemstone symbolizes love good health, and hope. Aren’t birthstones associated with the birth month? Not at all. Birthstones are only associated with zodiac signs. 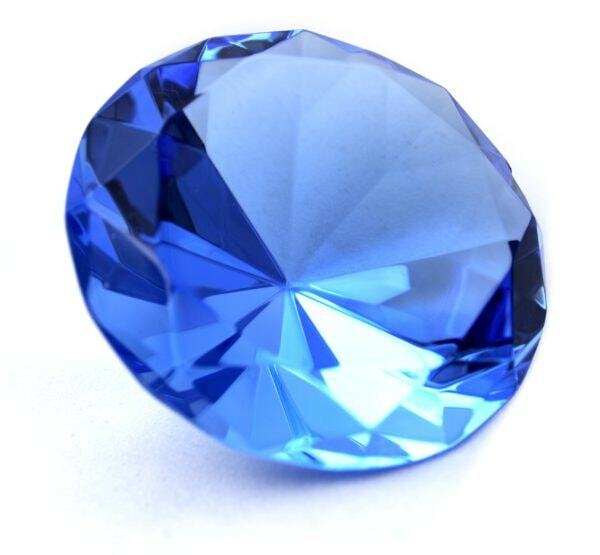 For example, there is no such thing as an ‘October Birthstone’. Rather, in the month of October, Opal is the birthstone till the 22nd and Topaz is the birthstone for the rest of the month. Jewellers have included months of the year (incorrectly) because they wish to sell everyone birthstones, rather than those that believe in astrology. As you may know, there are two zodiac signs that fall in every month of the year (as they follow a 23rd to 22nd cycle). Be careful what you believe in! The main difference, as pointed out above, is marketing. While the correct format for choosing a birthstone is according to the gem associated with your zodiac sign, marketers often promote birthstones month-wise to make it more accessible and easy to understand to their audiences and appeal to those who aren’t interested in the astrologically significance of these gemstones. So, two people may be born in the same month but if one is born at its start and the other at its end, they will have difference zodiac birthstones because they are born under different star signs. Some marketing material, however, will club these two dates as having the same birthstone. So it is always a good idea to follow zodiac sign birthstones when picking a personalised piece of jewellery rather than going with a jeweller’s monthly suggestion of a ‘lucky’ birth month gem. The zodiac calendar is ancient, whereas the calendar we use originated relatively recent in history. The Julian calendar was introduced by the Romans in 45 BC and this calendar did not align according to zodiac signs. Even later on, with adjustments made and the opportunity for the calendar to align with the zodiac signs, other interests were given greater importance. Therefore, in recent times there have been efforts to simply the use of birthday gemstones to the public, categorising them month-wise while promoting their beauty and benefits. Is there any harm wearing a birthstone that isn’t associated with your zodiac sign? Well, if you have already bought a birthstone that is associated with your birth month, rather than your birth sign, most likely you’re wearing a birthstone that’s associated with the previous month. What if your birthday is on March 25th and you’ve bought an aquamarine necklace according to monthly birthstones instead of your zodiac birthstone which is actually diamond? There’s no need to worry. 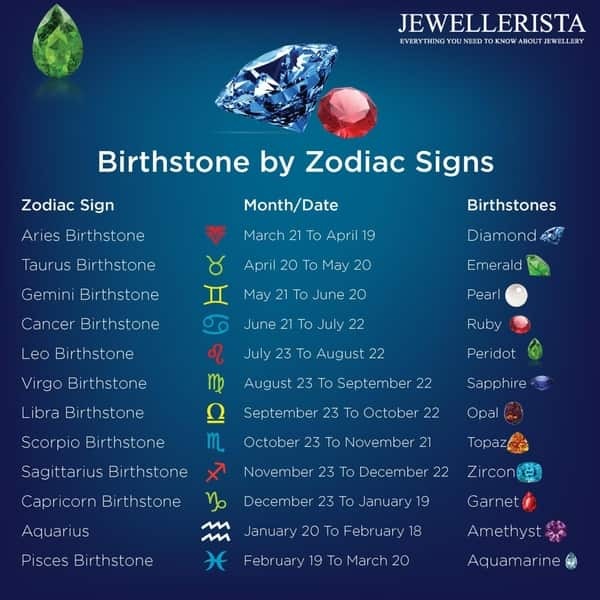 Your zodiac birthstone is the gem that is thought to influence your potential in the most positive way, however, the birthstone of the previous zodiac sign also has significance to you. These gemstones are called your twelfth house gem and are said to aid your interacts with others has it enables you to tune into their energies. These gems provide the wearer with a psychic energy that enables them to pick up the good qualities of those around them. Birthstones make excellent gifts, not just for that special someone, but also for family members and friends. Do let us know in the comments if you have any questions regarding the birthstones and their association with zodiac signs. Do note that while we have associated one stone with each zodiac sign, there may be others that are now accepted, too. 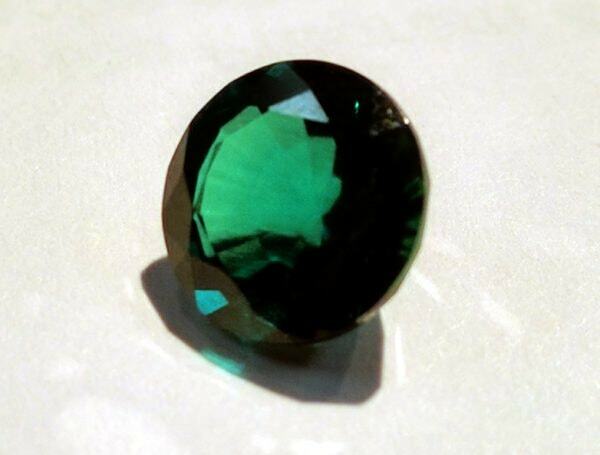 For example, Spinel is now accepted as a birthstone for Leo, along with the Peridot. An apt, short and comprehensive description of gem stones corresponding to the Birth sign. It’s very useful for all those, who do not have time to go through details. A knowledgeable and informative site. Is there an alternate birthstone for Scorpios? Although Topaz is generally accepted as the birthstone for the zodiac sign of Scorpio, the sign is also associated with a few other gemstones like aquamarine, opal, beryl and tourmaline. If you don’t fancy topaz jewellery you can always choose one of these equally beautiful and meaningful options. Hi – would like to know where I can purchase a nice pisces birthstone necklace? Pisces birthstone is the beautiful blue aquamarine. Aquamarine jewellery is found at most gold and silver jewellers. Online, you can check out Bluestone, Candere or the brands that feature on this list of best jewellery stores in India .